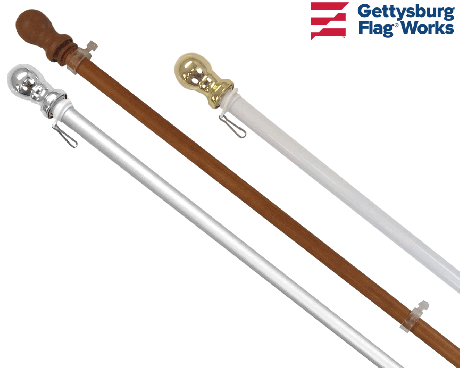 When it's time to replace your house flag pole for a flag with grommets for mounting, Gettysburg Flag Works can help. 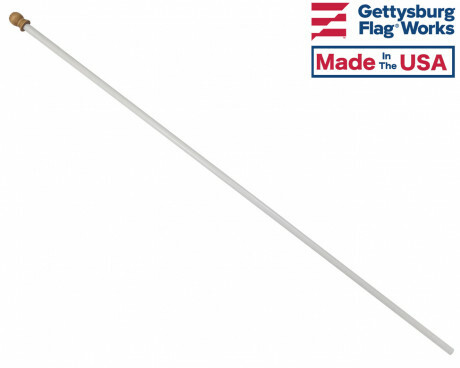 We highly recommend our rotating aluminum flagpoles for either grommets or a sleeved flag because it comes will a clip for a sleeve or ring attachments for grommets. 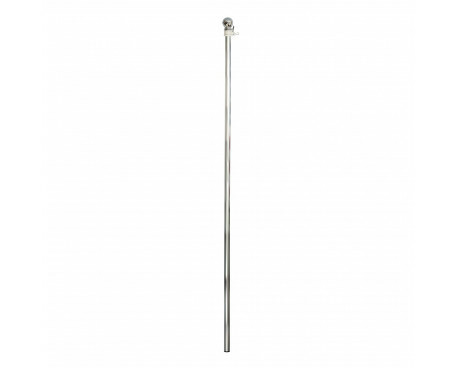 Rotating aluminum poles don't rust, rot or warp and come in white, silver or wood grain colors. Other options for your house flag pole for grommeted flags is our tube aluminum residential flag pole, fiberglass flagpole or wooden flag pole. 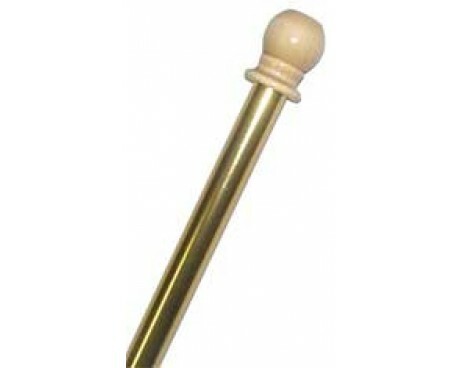 If your wooden flag pole doesn't come with attachments for grommets, we offer ring attachments and Never Furl options. Sleeved American flags and decorative banners are a little easier to outfit with a residential flag pole. Our rotating aluminum pole has a metallic coated plastic ball top & comes with clip and washer for sleeved flags & ring attachments for header & grommets flags. THIS IS A GREAT POLE! There is nothing to rust or rot. We Call it "Worry-Free". In addition to the rotating residential flag pole, we offer wooden flag poles and fiberglass flag poles for home. Wooden flag poles are beautiful and traditional looking. 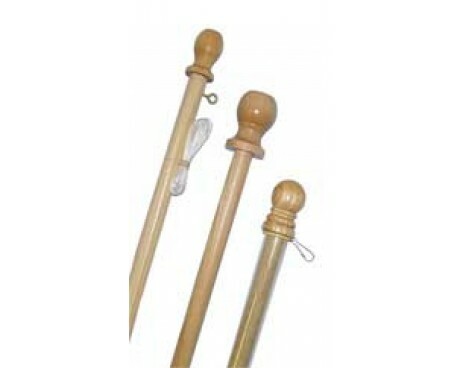 We offer wooden flag poles in 5, 6 and 8 feet long in 1 inch or 15/16" diameter. Many people still use a wooden flag pole but if you are looking for something more durable we've got a great option for you. 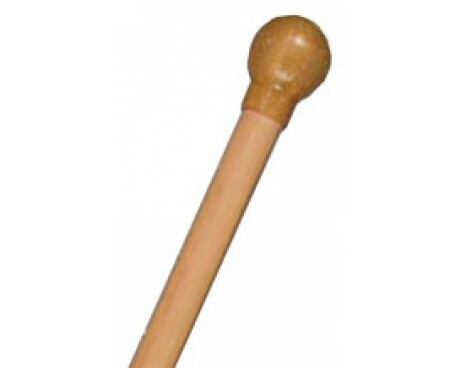 Our 5 and 6 foot spinning flag poles for home are available in a beautiful faux wood finish. 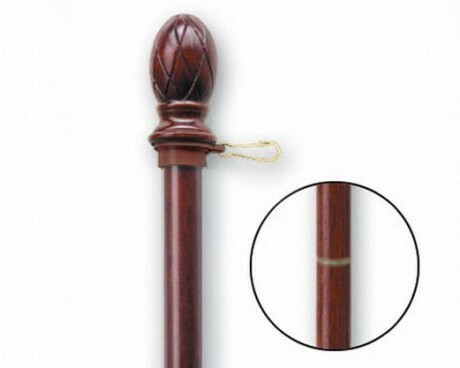 This type of wooden flag pole will not warp, rust or rot. You will not need to revarnish it either. When ordering your new wooden flag pole, be sure to get all of the parts that you need to display your flag or banner. Wooden flag poles don't typically come with the rings or attachments needed for mountain your house flag. 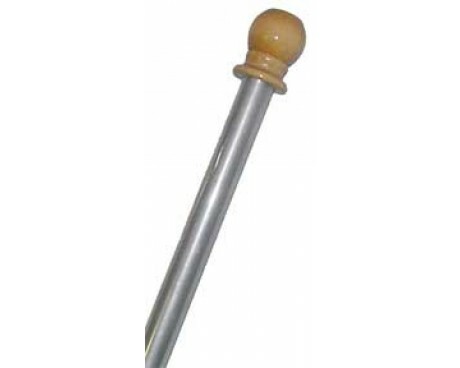 For mounting grommeted flag sot wooden flag poles, you will need grommet rings. To mount a sleeved flag to a wooden flag pole, we recommend a Never Furl kit or a pole ring with unfurling action. 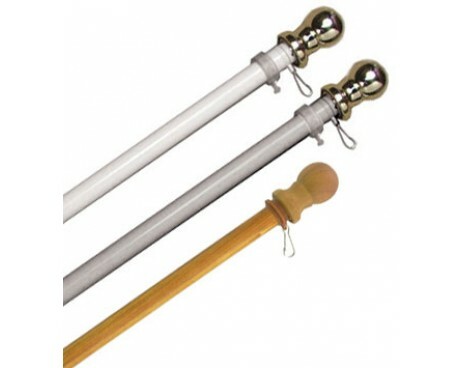 Rail Mount with Aluminum Pole (1" Diameter): Aluminum pole with .058" wall thickness, 6' long two piece swedged, cast aluminum adjustable bracket, 100% brass finial and Never Furl® swivels for both grommeted flags as well as pole hem flags and banners. This bracket works great on wrought iron, aluminum, or wood fences from 3/8” up to 2” square, rectangular, round or oval railings. Ideal for balconies on ground-level condo's and apartments, or wrought iron and chain link fences around your home or business. Also works great on boats and RVs. Flag not included. Pole Ring (Unfurling action): 2 part rotating ring for attaching sleeved flags to a residential flag pole. The collar attaches with an included screw and the rotating ring sits above it and clips to the flag, keeping it at the top of the pole and free to rotate in the wind. Never Furl Kit (Unfurling action): With Never Furl, you can fly your flag all day long, every day of the year, and the wind will never wrap your flag around the residential flag pole. The Never Furl kit is easy to install and comes complete with everything needed, including instructions and detailed drawings. No additional tools are required. 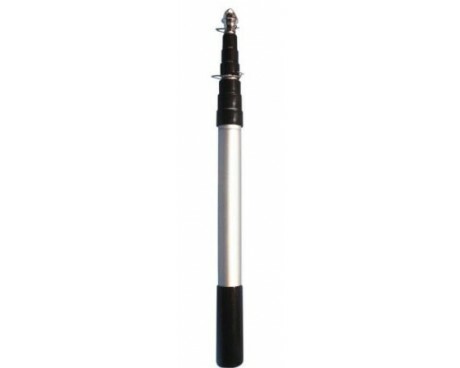 Unfurler Tube Attachment (Unfurling action): Clear plastic tube comes in 3' and 4' lengths with hardware used to attach to a 1" residential flag pole. Flag attaches using re-usable ties to the tube which rolls around the pole with the wind. Clear Ring Attachment (No unfurling action on solid poles): Attaches grommeted flag to 1" diameter residential flag pole. Will not allow flag to unwrap automatically. For unwrapping device see Unfurler tube.